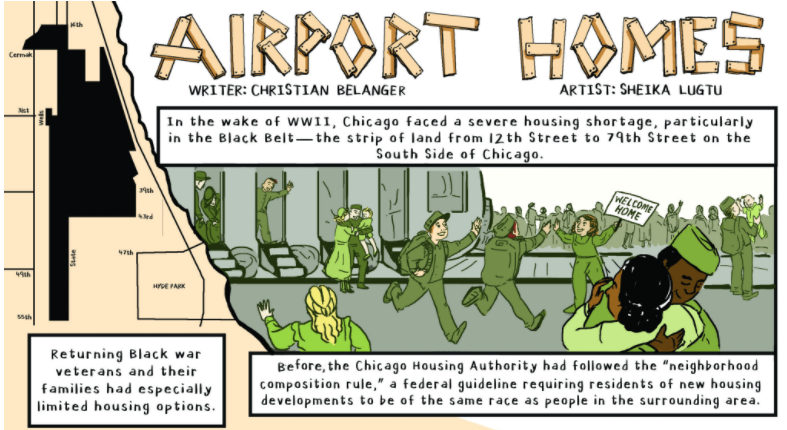 Written by Christian Belanger, published Feb 2018 "Housing Issue" of the South Side Weekly. See full comic here. "When the 45th president was elected , I and most of the country was thrown into a massive shambles..."
"Resistant" is a meditation on roots, adaptability, normalization, and resistance. Published in the 'Tyrant' issue of Australian literary journal The Suburban Review. See full strip here. "The Gresham Experiment" is a 2-part comic exploring the connections between food policies, race, and violence. This strip links food access issues to the mainstream media depiction of the Auburn Gresham neighborhood as violent and dangerous -- and the subsequent presentation of gun violence as a public health issue in its own right. But maybe the connection between violence and food access isn't so complicated: Maybe ensuring the success of in-place food access policies can directly impact the biggest public health issues that disproportionately afflict majority-Black neighborhoods. Done in collaboration with journalist Anne Elizabeth Moore as part of The Ladydrawers column on Truthout.org. "Comics in India: A Too-Brief Survey of Narrative Images"
Comics in India: A Too-Brief Survey of Narrative Images in India and Contemporary Indian Artists, a 3 page research-based comic. View the entire strip here. In 2011, I deal with a slow recovery. I was bedridden for half the year, then on crutches. My sudden disability completely disrupted my plans, throwing me into uncertainty and depression. The end of the year threw an even bigger curveball, forcing Micah and I to go into an even longer-distance relationship. By 2012, relationships are strained but new friendships are formed. Ever the optimist, I am back in school and working hard. The comic becomes more art-focused; chronicling my projects, inspirations and disappointments. Through rough months, I come face-to-face with my dreams as I am accepted into the School of the Art Institute of Chicago.